If you've ever needed to look good on a business or personal trip, you'll already know how hard it is to find something appropriate to wear. Most stylish clothing seems to wrinkle when you get it within 10 feet of a suitcase, often needs to be dry-cleaned, and isn't practical in hot or humid climates. Travel-specific clothing, on the other hand, typically makes you look like you're about to go hiking in the Amazon, covered in zips and pockets and coming in fourteen different shades of brown. Because of this, a small company decided to run a Kickstarter campaign to see if they could create something different. The end result: Bluffworks Travel Pants. They sounded great in theory: wrinkle-free, machine-washable, quick-dry and lightweight, yet still appropriate for the office. But there's nothing quite like a real-world test. I got sent a pair to put through the wringer (pun intended), and here's how they fared. Bluffworks pants come in two styles, Original and Chino, in a range of colors. The original pants let you choose between regular and relaxed fit – I opted for regular, in charcoal. Depending on the version you choose, waist sizing runs from 28-32” to 40”, with 28-36” legs. All of the Bluffworks pants have travel-friendly features like a hidden internal pocket at the front, and a larger, zippered pocket at the back. They're breathable, 100% polyester other than the nylon pockets, and can be line or tumble-dried. I'd been traveling in the South before receiving my pants, a detail that's relevant due to the impact it had on my waistline. I'd ordered my usual size, but the pants were a little on the snug side. If you haven't been surviving on a diet of biscuits and gravy for a few weeks, you'll likely have no problem – but if you're unsure which size to go for, I'd suggest the next size up, at least for the regular-fit Originals. The company sells “odd” sizing (31”, 33” etc) through most of the range. My experience with all-polyester clothing hasn't been great in the past. It's often appeared shiny and cheap, and tended not to breathe well, making me hot and sweaty in anything but cool weather. I was pleasantly-surprised by the Bluffworks pants, however – at first glance, and even under closer inspection, they easily passed for cotton or even wool. After wearing them for a day, I rolled them up, put them in my over-stuffed backpack, and flew to Europe. If anything was going to test the wrinkle-free claims, it would be a day spent bouncing around aeroplane holds and luggage belts. Unpacking at the other end, the pants were largely unwrinkled. There were a couple of creases on the legs, but they disappeared after a few minutes of wear. There are plenty of pockets, and I was happy with their size and layout. The hidden, zippered section inside the front right pocket is designed in such a way that it easily fits a passport and credit cards or money, without it being apparent to anybody else. No pickpocket could get in there unnoticed, even if they knew the pocket existed, and you'd even have a good chance of retaining whatever was inside in a mugging. One of the two back pockets also has a zip, for extra security. There's a smaller pocket to slip a phone into as well, although I'd personally only put it there temporarily, as it'd be easily removed by someone else without you noticing. The pants were comfortable, and easily appropriate for an office environment or nice restaurant, at least in charcoal. You'd be able to go straight from red-eye to business meeting without a problem. If you'd prefer something a little less formal, maybe opt for the brown or blue shades, or the chinos instead. The pants stayed fresh and unwrinkled, even after walking up and down the hills of Lisbon on an 85 degree afternoon. After a couple of days, I threw them in the washing machine with the rest of my laundry, and they dried – wrinkle-free – on the line in an hour. I like the Bluffworks Original pants a lot for travel. Especially if your trip is more office and high-end restaurant than lying beside the pool, they're a rare mix of style and practicality. Being polyester, they're also unlikely to show signs of wear even after extended use. 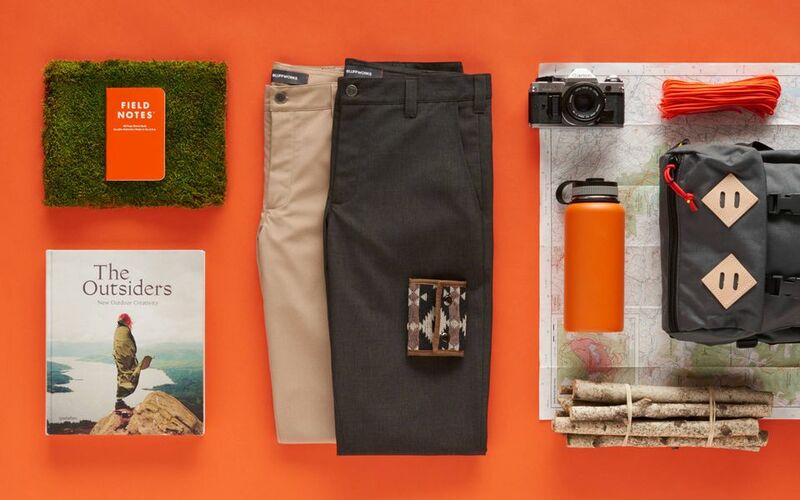 At around $100, they're not the cheapest pants you'll ever buy, but the extra security and easy maintenance offer great value for frequent travelers. At the time I've writing, I've been using my Bluffworks Original pants for a little over 18 months. They don't get worn all the time, but have accompanied me on several trips, ranging in length from a couple of days to several weeks. So far, at least, they haven't shown any visible signs of wear. Some polyester clothing can wear quite badly over time, but the Bluffworks pants don't seem to suffer from the same problem. As a result, I can still recommend them, even for long-term use.